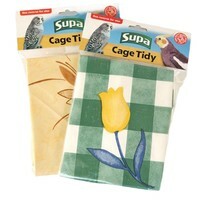 Supa Bird Cage Tidy has been especially designed to attach to the underside of your bird's cage to stop debris from falling to the floor. By catching the debris in this way, the Supa Bird Cage Tidy prevents a lot of unnecessary mess and hassle for you to clean up. Please Note: This product comes in various designs which unfortunately cannot be guaranteed.